This generous donation by 100 Women Who Care-Fox Valley will fund the Success by 6 2017-18 school year. 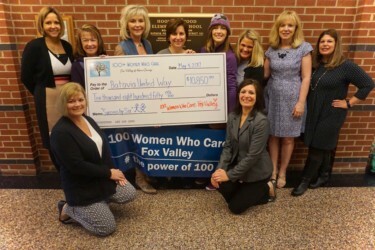 ​100 Women Fox Valley was Co-Founded by Batavians Theoni Limouris and Karen Hollis. for the purpose of raising funds for worthy area charities with a “power in numbers” approach. The group meets 4 times per year and each member, or team of two, commits to a check for $100 at each of the four meetings.